oEmbed allows you to import videos to your gallery from various platforms, such as Facebook, Twitter, Daily Motion and Ted. For a comprehensive list of sites from which you can embed videos, look here. Below are examples for Daily Motion and Ted. 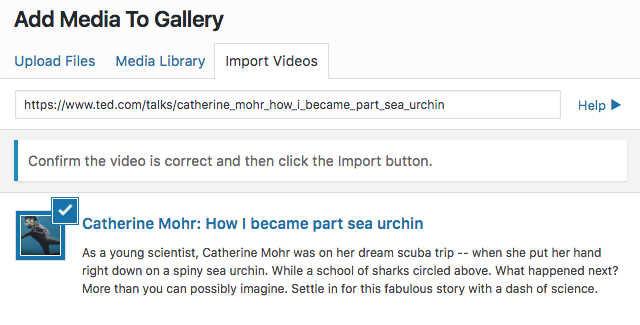 To import a video from Daily Motion, first find the video. 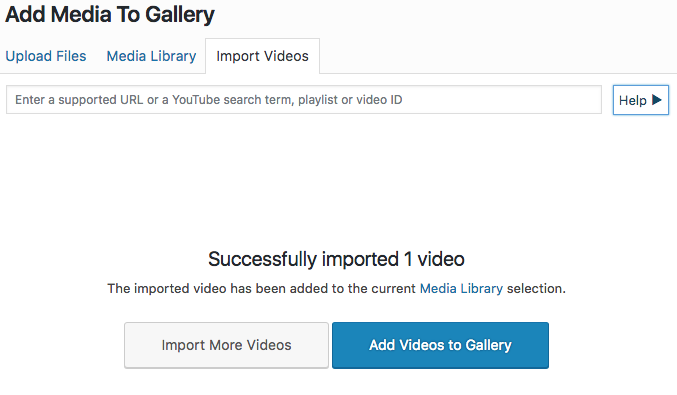 Copy the URL and paste into the Import Videos field for your gallery. The video will appear below this. Check that it is the correct one and click on the Import button in the bottom right hand corner. Once your video has been successfully imported, you will see the below screen. To add the video to your gallery, click on the Add Videos to Gallery button. You can import videos from TED. On the TED website, find the video you would like to include in your gallery. Open the video and copy the URL. Copy this into the Import Video field for your gallery. Check that the correct video has been pulled in, and click on the Import button in the bottom right hand corner. Where possible, your gallery will use the thumbnail from the video you have imported. However, not all oEmbed links will include a thumbnail, as it is not required by oEmbed standards. To display a video in your gallery, though, you must include a thumbnail. Should your imported video not automatically include a thumbnail, you will need to select one from your media library. Once you have imported your video, you will see the below form appear. To load a thumbnail, click on the Select button next to the Thumbnail field. This will open your Media Library, from which you can choose an image. Note: if you want to use a specific image for your video's thumbnail, you will need to add it to your Media Library before you import your video.